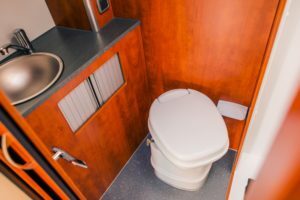 Home › RV › Do I Need A Bathroom In My RV? So, you just bought a used RV or maybe even an old school bus for a conversion. That means it is time to start turning it into your dream home-on-wheels. Before you start your RV renovations, there are many things you need to consider. From the floor plan to the décor, you want your RV to be everything you ever imagined it could be. You may be surprised that one of your biggest questions is: Do I need an RV bathroom? Most people’s first thought might be yes, of course I need a bathroom! 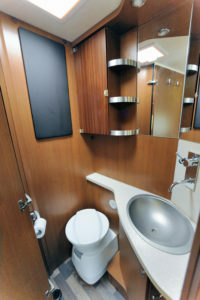 It’s a popular belief that you should add a bathroom to your RV when renovating because it’s seen as a necessity. However, if you’re always outdoors, camping and/or boondocking, who’s to say you’re not perfectly content with using the wilderness at your convenience? Even if you’re not comfortable with that, many rest stops and campsites provide bathroom amenities. The more you think about it, you may realize that an RV bathroom isn’t always an absolute necessity. Should I Install a Bathroom in My RV? Like most amenities, there are pros and cons to adding a bathroom to your RV. And it’s not necessarily a simple yes or no answer. There are many questions you should ask yourself before deciding whether or not you need an RV bathroom. First of all, do you even need one? If so, where can it fit in your RV? Do you want to install a shower in there, too? Don’t worry, we’re here to help you make the decision. Check out the pros and cons of having an RV bathroom below. Then, you can decide for yourself if you need one. Convenience. People are used to having a bathroom readily available to them pretty much everywhere. Whether you’re in a home or in a public place, there’s usually a bathroom nearby. If you’re just starting out as an RVer or planning to go full-time, then not having a bathroom at your disposal could be a big adjustment. 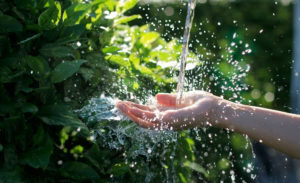 Without a shower in your RV, you will also have to plan your trips around when you will be able to get clean again. Not all RV sites and rest stops will have showers. This could be too much of an inconvenience for some RVers. Cleanliness. Let’s face it. Most public restrooms are questionable at best, especially at campsites and rest stops. Having your own RV bathroom means you know exactly what’s been going on in there. You can clean it as often as you want, and you don’t have to share with anyone you don’t want to. It’s a good feeling to have your own toilet and shower to use without having to think about who was using them before you. Travel. This ties back into the convenience factor. With an RV bathroom, you can pretty much go anywhere in the wilderness without having to worry about where you’re going to do your business. If you’re a woman RVer, then you know using nature as your toilet isn’t always comfortable or convenient. Having access to your own bathroom anywhere and at any time means less worrying about where you’re going to go when you have to go. Space. Depending on the size of your travel trailer or camper van, you may not have a lot of space to work with. And a bathroom, even if it just has a toilet, can take up a lot of the available space you do have in your RV. That space could be used for extra storage, additional seating or even allow for a bigger bed. Storage is a big factor to consider when renovating your RV. A bathroom also requires cleaning supplies that will take up additional space. Is the convenience of an RV bathroom worth all of the space it will be taking up? Maintenance. While RV bathrooms are convenient in some ways, they can also be really inconvenient. 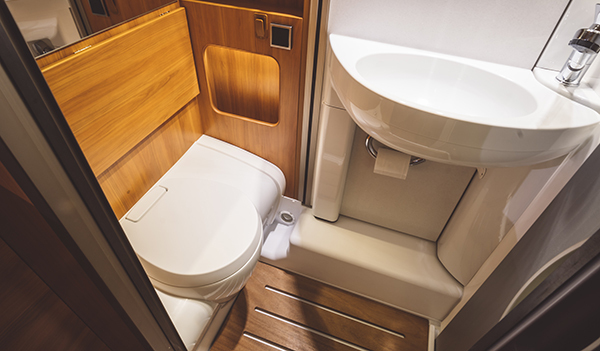 If you choose to install a bathroom in your motorhome, it will require a lot more maintenance than a regular bathroom at home. 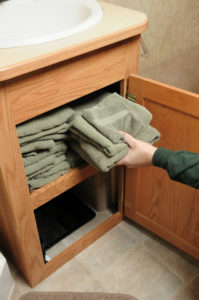 In an RV bathroom, all of the waste drains into holding tanks that must be emptied regularly. That means you’ll need to find a dumping station to empty, clean and refill your black water tanks. This could be a lot more hassle than its worth, especially for frequent RVers. Is an RV Bathroom Really a Necessity? Depending on your age, physical needs and lifestyle, you may not need a bathroom in your RV after all. If you’re still on the fence about it, there are some alternatives you can consider. Maybe space and storage are a big issue, but you’re not ready to give up the convenience of a bathroom completely. Consider a portable or composting toilet that can be stowed away when it’s not in use. You can also get an outdoor shower so that it doesn’t take upspace inside your RV. These options could be just the middle ground you’re looking for. For portable toilets, which are a pretty affordable alternative, check out Thetford Portable Toilets. Composting toilets are more expensive but easier to maintain, so check out Nature’s Head Composting Toilet. While you won’t get a luxurious, long-lasting shower out of these, you can check out RinseKit and Solar Shower for some outdoor shower options. Whatever you decide, you’ll still need Specialty RV Insurance. Buying an RV is an investment, even more so once you’re done renovating it. A standard Auto Insurance policy will not adequately cover your home-on-wheels. Speak with an RV Insurance Specialist today at (866) 501-7335 for a free quote. This content is offered for educational purposes only and does not represent contractual agreements. The definitions, terms and coverages in a given policy may be different than those suggested here. Such policy will be governed by the language contained therein. No warranty or appropriateness for a specific purpose is expressed or implied.